The lost spacecraft was the Indian Space Research Organization (ISRO) Chandrayaan-1 spacecraft, which ceased operations in 2009. The new technique employs the use of interplanetary radar and was developed by scientists at NASA’s Jet Propulsion Laboratory (JPL). By using the technique to detect the locations of one active and one dormant spacecraft, scientists are pioneering a technique that could be used to assist planners for future Moon missions. The new technique employed the use of the 230-foot (70-meter) antenna at NASA’s Goldstone Deep Space Communications Complex in California and the 330-foot (100-meter) Green Bank Telescope in West Virginia. During the experiment, the team directed the Goldstone antenna to transmit a powerful beam of microwaves toward the Moon and used the Green Bank Telescope to receive the radar echoes that returned back to Earth. When compared to LRO, Chandrayaan-1 is very small, measuring about 5 feet (1.5 meters) on each side. However, Chandrayaan-1 remained in a polar orbit around the Moon, which, according to JPL, made it a perfect target to demonstrate the new radar technique. 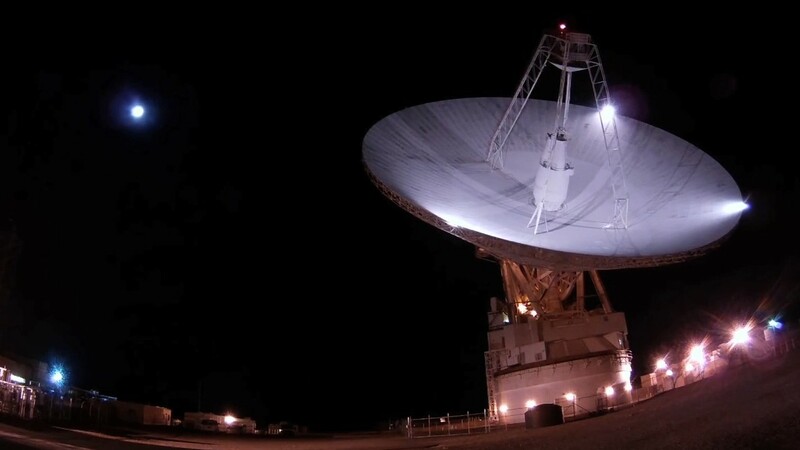 On July 2, 2016, the JPL team pointed the Goldstone antenna to just above the Moon’s north pole and waited for the spacecraft to cross in front of the radar beam. 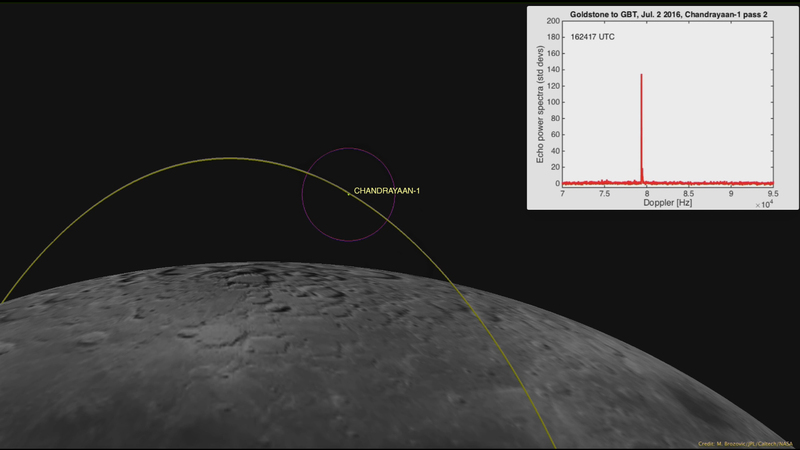 Based on orbital parameters from 2009, Chandrayaan-1 was predicted to be completing an orbit around every 2 hours and 8 minutes. 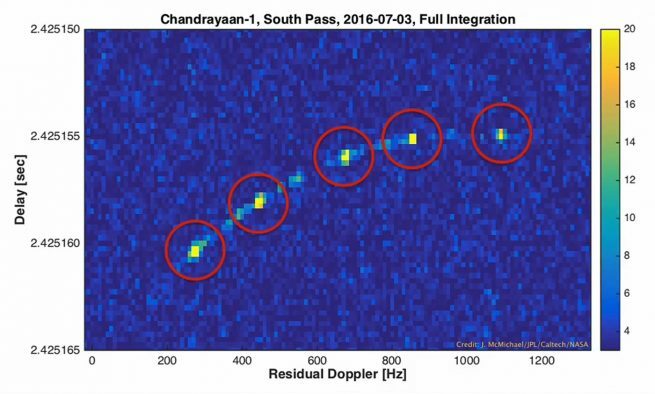 During 4 hours of observation, scientists observed the radar signature of a small spacecraft twice during the period, which corresponded with Chandrayaan-1. The radar data was used to calculate the spacecraft’s distance and velocity in order to improve future predictions for its orbit. By observing LRO and rediscovering Chandrayaan-1 using the new radar technique, scientists are demonstrating that ground-based radars can be used on future missions to the Moon to aid in collision avoidance and to assist with spacecraft that encounter navigation or communication issues.